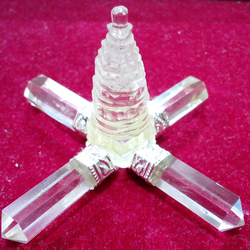 The company stands tall among the Suppliers of Panchdhatu Shree Yantra in Moradabad. - The company offers the very best Panchdhatu Shree Yantra in many sizes in safe and durable packaging. Made using the best grade brass and panchdhatu, the Panchdhatu Shree Yantra is known for its finishing and accuracy. Sri Sarva Rakshakara Maha Yantra, consisting of Gayatri Yantra, Chandi Yantra, Prathyankara Yantra, and Bahalamukhi Yantra helps to give complete protection against all sudden catastrophe and evil doings and and protection from enemies always. 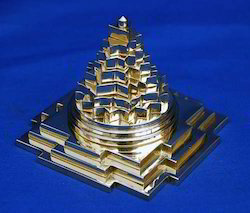 This is a beautiful shri yantras by crystal.